Should Christians believe in Freedom of Speech? Since the recent terror attack in Paris I’ve had a few people ask me about what I think about Charlie Hebdo and especially about freedom of speech. It intrigues me that only about a year ago, the Urban Left in Australia were (in the most part) rallying against the Prime Minister Tony Abbott and the Attorney General George Brandis’ Freedom of Speech (repeal of s.18C) Bill 2014. The consequence of Abbott and Brandis’ amendment would be that people would have more freedom to say what they think, and not be at risk of litigation from others who might be offended. Advocates for this change were even willing to say that people should have the right to be bigots if they want. For those who don’t think much beyond a level that might appear to be, shall we say, deeply shallow, the inconsistency may not have risen to surface consciousness. The outpouring of apparent support for free speech around the world has warmed the hearts of many. Is it really support? Or is it, and I think this is more likely, just another example of today’s de rigueur team sport of conspicuous compassion. Put more bluntly, it may be just a very elegant way of saying, “Look at me, I am a thinking, caring person”. It is one of those “costs so little, feels so good” sort of things people can say or do. Charlie Hebdo has poked fun and caused offence indiscriminately for years. 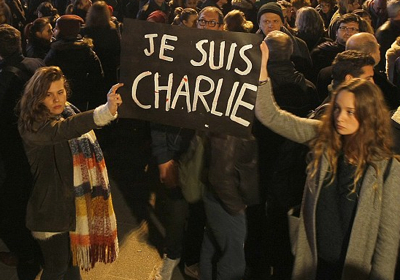 “Je suis Charlie” placards support their right to do just that. Sadly, all too many recognise a disaster of any type as an opportunity to improve their own position. Be there, look concerned, improve your image. It can be sickening to hear the modulated voices of concern. I have found this contradiction of values to sometimes be the case with regards to secular people’s publicly espoused values about faith. I have had people tell me at the start of a conversation that they are an atheist, then some time later they acknowledge that really what they are is spiritual but not religious. Then another half an hour goes by and they reveal that they in fact pray and have had their children baptised. Without the evidence to back up my claim, my hunch is that more secular people than we expect will publicly identify as atheist/not-religious (because that’s a key qualifier for the secular urban majority like being socially liberal) but privately they dabble with the notion of a God who they can petition. It is easy to be sloppy when it comes to the formation of our values. For the Christian, however, this should not be the case. We do not have a silent God or an obscure faith, rather we have a God who reveals mysteries (Daniel 2:29) and he is given us the Bible so that we can have everything that we need for salvation (2 Timothy 3:16). Should Christians be in favour of Free Speech? So let’s return to Charlie Hebdo and the issue of free speech? Should Christians be in favour of free speech? To tell you the truth, I think a Christian can be faithful to the gospel of Jesus Christ and sit on either side of the debate. But as I begin to discuss this, you will see just how complex this all is: complex issues interlocking with other complex issues. Part of me wants to be in favour of free speech, because it’s a nice ideal, and the preacher in me doesn’t like the idea of others telling me what I can and can’t say. And I do believe that I should be able to return the favour to others: let them express their views. Therefore, like all minority groups will say, if freedom of speech is to be tampered with, let it not be so that I can’t express my views! (This is a problem we are going to have keep in view). There are, then, several problems to consider. And the biggest problem lies in the concept of ‘freedom.’ Neo-classical liberalism, which emerged in the late Nineteenth Century, promotes the idea that human freedom comes from being unrestrained, and, therefore, government interference in the lives of the people should be minimised. Thus, freedom of speech is one of those freedoms that the neo-classical liberal wants to vehemently protect. Christians, on the other hand, believe that the foundation of neo-classical-liberalism is false. Christians believe that true freedom comes not from being unrestrained to make one’s own decisions but from life in the Triune God. ‘It is for freedom that Christ has set us free. Stand firm, then, and do not let yourselves be burdened again by a yoke of slavery.’ (Galatians 5:1). The Christian may or may not believe in free speech, that’s up to them to decide. Either way true freedom does not come from having free speech or from having boundaries around speech. Rather, true freedom for the Christian, as indicated above, has the ‘content’ which is the Gospel. In this content, Jesus has given us examples for how to apply the gospel to our lives. In Matthew 7:12 Jesus said, ‘So in everything, do to others what you would have them do to you, for this sums up the Law and the Prophets.’ This means just as I would want others to give me the right to talk about my faith publicly, so should I want that right for other groups – even those who oppose me. Just as I would want those critical of my faith to still maintain respect and graciousness in our public and private words, so should I have respect and graciousness towards those with whom I disagree. This is what it means to have an open and charitable dialogue with the no religion tribes about Jesus. In fact, if Jesus is my example, those whom I can be most aggressively critical towards are my own people (Matthew 12:34); but even then, the disciple of Jesus must never incite persecution or violence. If you keep looking at the content of the Gospel, high at the top of the list of priorities is the Christian’s responsibility to be an ambassador for the Kingdom of God, promoting love and justice in society. Christians must stand up and show Christlike (Good Samaritan) love to persecuted people (Luke 10:25-37; John 7:53-8:11). Given this is the case, I can understand why a Christian might want to place restrictions on free speech. We want to protect those on the margins and have a society where minority groups are not verbally abused and where people don’t stir up hatred against each other. However, if we don’t want the freedom of speech laws to hamper our ability to speak publicly about our faith, we are going to have to work hard at learning to speak about those challenging issues that relate to persecuted minority groups (such as other religions and sexual minorities) in a way that is faithful to the gospel, challenging and also gracious and loving. Unfortunately, enough damage has been done in our history so that we have a bad reputation in the broader society for being ungracious rather than having speech ‘seasoned with salt’ (Colossians 4:6). Complete Freedom of Speech might work in some societies, but not in every context. Societies don’t exist in cultural and historical vacuums. Germany, for example, has their horrific historical context of the holocaust: so their legal concept of Volksverhetzung (laws against the incitement of hatred against segments of society) makes sense. Similarly, with Australia’s history of persecution and violence towards the Aborigines, it is understandable (in light of Andrew Bolt’s racial vilification court case) why so many Australians were anxious about the proposed changes to the Freedom of Speech laws. Don’t think that, however, that I’m necessarily arguing against the Christian’s choice to be in favour of free speech. If that is what you choose then go ahead! But as you do, make sure you apply the Gospel faithfully to your life. Don’t wrongly believe this is how you will find true freedom. Keep your focus on standing up for those in society who are persecuted – over and above protecting your ‘right’ to free speech (an American right not an Australian right – while we have some rights in Australia as protected by law, we don’t actually have a Bill of Rights yet, and we certainly don’t have a law that ensures complete freedom of speech in that neo-classical-liberal sense). In the early chapters of Daniel we read of Daniel taking the advice of the prophet Jeremiah who told the Jews in exile to embed themselves in the Babylonian community and to build their lives there (Jeremiah 29). Most of all, they should seek the peace and prosperity of the city (Jeremiah 29:7) which is the very thing Daniel did when he stepped up to interpret the King’s dream and thereby save his fellow public servants from being killed (regardless of the fact that they were pagan magicians and sorcerers). While Daniel should be an inspiration for us, he is only a shadow of Jesus, who would come about 500 years later to be the true saviour of the world. Jesus not only brought peace to the city, He brings peace to the whole world, for He is the Prince of Peace. Defend freedom of speech or not, either way, seek the peace of the city – don’t be an inciter of hatred – rather protect the lives of minorities – for that is the Jesus way. We don’t need to be sloppy with the formation of our values. We also don’t need to be confused about where our freedom lies. We have Jesus and his Gospel which brings true freedom. Whatever our views on freedom of speech are, let us pursue consistency (rather than inconsistency) of values by drawing them out of the Gospel. Let us imitate Daniel and seek the peace and prosperity of our city. And let us imitate Jesus: the personification of divine grace, as we interact in our complex world.